Radiographs should always be taken when a horse has had laminitis. Use digital radiographs (see below) if at all possible. Thoroughly clean and ideally trim the foot. A radiodense marker (a sawn-off drawing pin is ideal) can be placed just back from the apex of the frog - this is particularly useful if the horse is likely to be shod with frog support. The horse will need to stand on a wooden block and should be weight bearing, therefore either the leg not being x-rayed should be held up, or both (e.g.front) legs should be on blocks. It is conventional for markers to be placed on the dorsal or lateral aspect of the foot or limb (this is particularly important for DP views). Lateral-medial radiographs of P3 help assess rotation and sinking. "The use of radiographs for diagnosis and interpretation of laminitis is an absolute necessity..."
Radiographs are useful for diagnosis, prognosis and to guide treatment. Lateral views should be taken with both feet on equal height blocks and the main beam focused at the solar margin of P3, with the foot touching the casette to avoid magnification. Variation from the correct technique will result in artifacts and false information. It is essential to mark the dorsal hoof wall and frog apex, e.g. with barium paste. Useful measurements include the coronary/extensor distance, sole depth, the horn:lamellar distance, and the palmar angle. The dorsal angle is not (particularly) important, and is influenced by deformity of the outer wall. Film v digital radiographs. 2 x-rays taken of the same horse, left fore, a few days apart, following acute laminitis. From the film x-ray on the left the first vet diagnosed 4' rotation. From the digital x-ray on the right taken a few days later the second vet diagnosed no rotation. 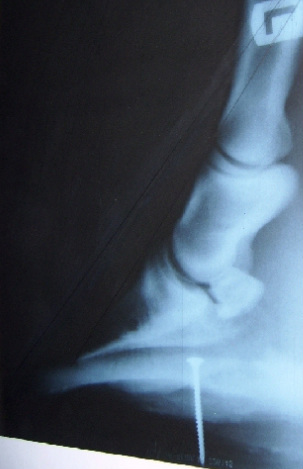 The x-ray on the left is an example of a bad x-ray - no markers were used, the horse was not weight bearing, the whole hoof is not shown therefore the relationship of P3 to the hoof capsule cannot be seen. The x-ray on the right is an example of a good x-ray - markers positioned correctly and can be used for scale measurements, the horse was weight bearing, the relationship of P3 to the well balanced hoof capsule is clearly shown, the x-ray beam was perpendicular to the hoof. These x-rays cost much the same! Always ask for digital x-rays, ideally where the x-rays are processed on site - if your vet does not have suitable equipment, they should be able (and happy) to recommend another vet who does. Before considering a hoof wall resection, please read Dr Debra Taylor's presentation Laminitis Rehabilitation: If the corium is happy, there is hope. Have venograms taken, re-establish perfusion by minimizing mechanical compression and stretching of the corium within the hoof capsule. To reduce coronary corium compression, remove ground reaction force from the associated hoof wall at ground level, e.g. by beveling the hoof or dubbing the toe. Solar corium compression can be reduced by creating an air space beneath the rim of P3 (e.g. using thick pads inside hoof boots) and correcting the palmar angle. If this is insufficient to improve perfusion, higher level interventions to minimize compression may be considered, such as hoof grooving or partial hoof wall resection. NB product claims that are not backed by published research are claims, not research. Retention of any part of the placenta after foaling (or still birth) can lead to bacterial growth, inflammation and absorption of toxins, which can cause endotoxaemia, septicaemia, metritis, (SIRS) laminitis and death. Every part of the placenta should be removed, and the horse treated with systemic antibiotics and anti-inflammatories, and measures taken to prevent laminitis e.g. cyrotherapy. RISQI is the reciprocal of the square root of insulin, and represents the degree of insulin sensitivity (the higher the number, the more insulin sensitive). RISQI is calculated: 1 divided by the square root of the baseline insulin result. So if a horse's fasting baseline insulin is 9 µIU/ml, the square root of 9 is 3, and 1/3 is 0.333. According to the Virginia Polytechnic research below, a RISQI of 0.333 would be normal, not IR. A fasting baseline insulin of 25 µIU/ml would give a RISQI of 0.20 (the square root of 25 is 5, 1/5 = 0.2), which according to the Virginia Polytechnic research below would indicate a high laminitis risk. The use of the RISQI is not recommended by some vets - see Proxies and forum.